Mail Solutions: How to Access Mac OS X Files From Windows 7 or 8? Accessing files on a different Operating System is a difficult task. But now this task has become very easy with an advance option available in Mac Operating System X. This advance option is Microsoft Server Message Block (SMB) Protocol. The section below will explain how to access MOS X files from Windows 7 Operating System and view its contents on the local network. This will be done with some changes in System Preferences by allowing read/write access to Windows systems. Pre-settings: Mac OS whose data you want to access using Windows system must be part of the same Workgroup as the Windows computers and devices. 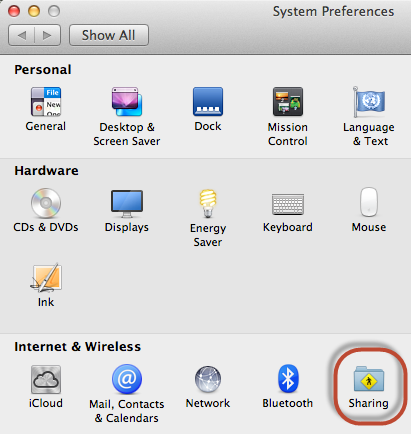 Open Sharing Pane in System Preferences in Internet & Wireless section. Go to Sharing pane where several options will be available. Check the File Sharing option. In case you want to enable DVD or CD also, check this box as well. 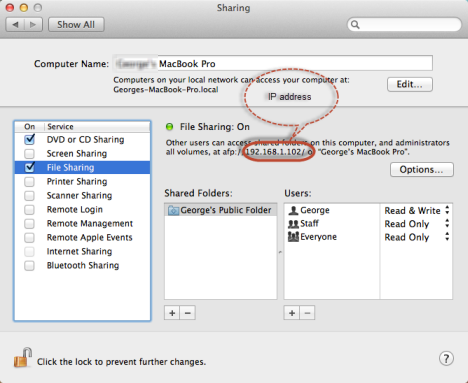 You will get to see the IP address of the Mac system when the File Sharing option is on. Now click Options to proceed. 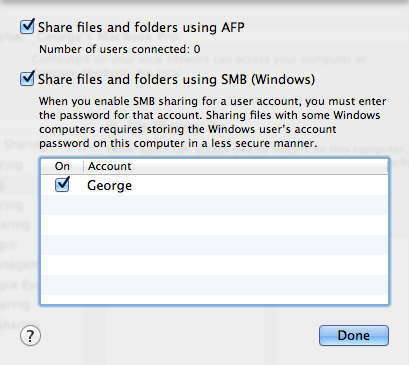 Here check the options of “Share files and folders using SMB (Windows)” and“Share files and folders using AFP”. Also check the users for which the sharing has to be enabled. 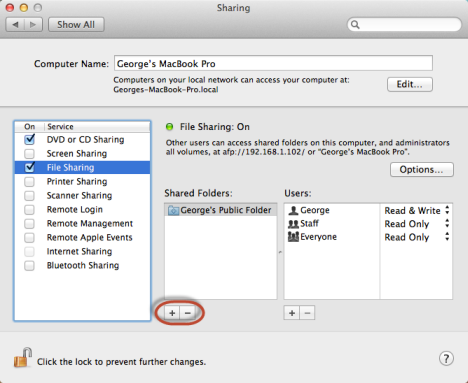 The users which you have checked will only be able to access the Mac’s shared folders. Click Done after finishing these steps to save changes. 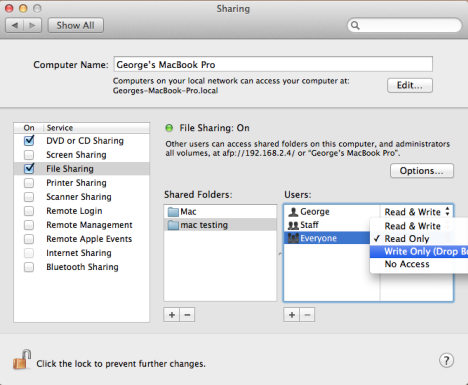 Note: If your Mac Operating System prompts for the password, provide it to enable sharing mechanism. Now in order to add a Shared Folder, click “+” button. 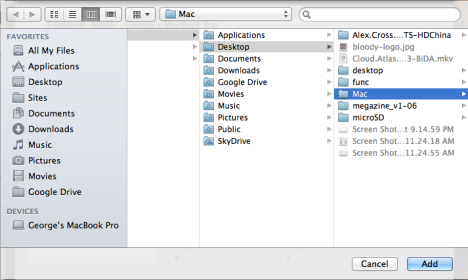 Another window will open (Finder) where you can browse for the folder to share with other Windows system and add them. To do so, select the folder and click on Add option. Now, as the Shared Folder is added, one can set the read/write permissions. In the Users section available in the right section all the users will be available. You can set the permissions to be assigned to these user accounts from Read & Write, Read Only, Write Only or No Access. Or you can also prefer to provide Read/Write permissions to Everyone (only on the network is trusted). Settings with Mac have been done, now it is time to perform settings with the Windows platform. Here we are elaborating steps with Windows 8 system. This is necessary so that the Windows 7 system under same Network is capable to access Mac files in Windows Explorer or File Explorer. 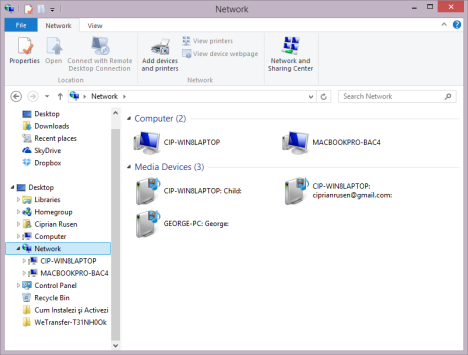 Open File Explorer and go to Network. If the Mac machine whose data has to be accessed is under same network and the settings mentioned in Section 1 has been done properly, this Mac system will be listed in networks. Double click the Mac and you will be prompted to enter the credentials. Here in the first test box provide the name of the Mac followed by “\” and afterwards the name ofs the user account of Mac. 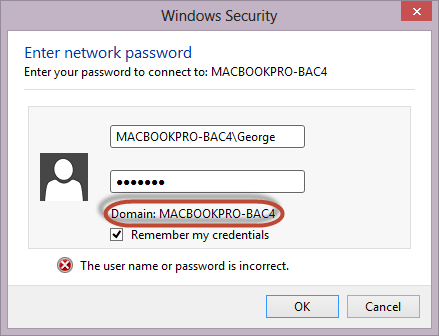 Domain entry will change to name of Mac and then you can enter the password and click on OK.
Mac’s shared folders will be displayed. 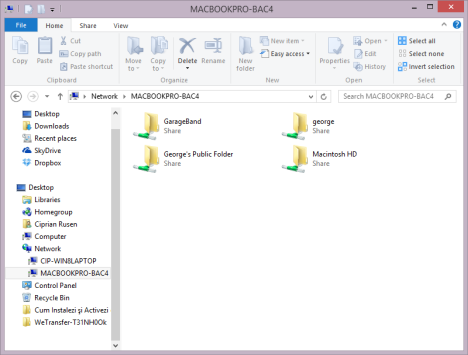 In this way you can easily access the data files on a Mac machine through a Windows system. But it is mandatory that both systems must be in the same local network and share a Workgroup. Make sure that the settings along with the pre-settings are done properly so as to make the Mac available on the network for Windows access. How to access MOS X files from Windows 7 will not be difficult after you follow the procedure mentioned in this blog. Moreover, if you want to access Mac Outlook data files to Outlook PST then you and utilize Mac Outlook Exporter software.